Presented by the Jefferson Park Chamber of Commerce in partnership with the Jefferson Memorial Park Advisory Council and the Chicago Park District, along with media partner 104.3 K-HITS Chicago. The Festival’s proceeds support local student scholarships and help build relationships with local businesses and the community. * Love ballet? Dancers from the Chicago Ballet Center will perform on Saturday and Sunday. * Giggle out loud with the physical comedy of Vaudeville at Six Corners who will perform on Saturday. * Hawaii in Chicago? The Hokulea Hawaiian Dancers will bring some island rainbows to the stage on Sunday. * Join in with the returning John Yost Drum Circle. Bring a drum or build one on Saturday and Sunday. * Flying or floating? It’s Aerial Dance Chicago dancing in mid-air on Saturday. * Art in the making? Award-winning art teacher and Nadig Newspaper cartoonist Ken Klopack will be drawing caricatures on Saturday. And the C3 Photo Fest returns with their curated photo contest – you get to vote! Our artists are peppered throughout the vendors’ area and pop-up in the park, Four Star Brass Band will lead you for a New Orleans romp through the park, and Sweet Fannie Adams will serenade you while you screen print your own poster. All this, plus a Kids Zone, with bounce houses, art activities, and family theater. * Enjoy taste treats from Gale Street Inn, Leadbelly Burgers, Smilin Dawgs, Caponies, Chicago Cupcake and Creative Cooking. * Wash that down with drinks from Lake Shore Beverage (Bud Light and Goose Island), Lagunitas, and Brugal Rum. The popular three-day Jeff Fest Arts & Music Festival runs Friday, July 24 through Sunday, July 26, 2015 and takes place on the grounds of Jefferson Memorial Park and includes a family-picnic area to enjoy the neighborhood food favorites. There are also two stages, a designated Kid’s Zone, art to purchase, and a juried photo art competition. Festival tickets can be bought at http://www.jeffersonpark.net/. The weekend is packed with music, too. Saturday’s headline act is Jonathan Jackson + Enation, a anthemic Alt / Rock / Pop three piece from Nashville, Tenn. The band recently released their fourth studio album, Radio Cinematic, through Loud & Proud Records. Rolling Stone says Radio Cinematic is “Filled with electric guitars, chest-beating vocals and swirling synths” while Billboard Magazine calls Jonathan Jackson + Enation a “rock band on the rise.” Their Emmy-Award winning frontman is also a well-known actor. Jonathan’s acting credits include “Tuck Everlasting,” “General Hospital,” “Insomnia,” & “Nashville,” in addition to many other TV and films. Friday kicks off with some “heavy metal” sound from Eliminator and Blackened, and Sunday features JC Brooks and the Uptown Sound (JCBUS). JCBUS call Chicago its home, and has toured North America and Europe, including playing at Lollapalooza. Jefferson Memorial Park is located at 4822 N. Long Avenue, just west of Milwaukee Avenue. Fest-goers are encouraged to take public transportation, as the Jefferson Park Metra and CTA Blue Line transportation hub is just a block from the festival grounds. Plenty of bike racks also will be available. Road closures: Linder Avenue and Long Avenue will be blocked off between Higgins and Lawrence Avenue for the three-day festivities. The fee for admission is $5 per person. It is free for children ages 12 and under, and adults older than 65. And if your name is Jeff, show an ID for free admission. Coolers and liquor are not permitted. Festival hours are Friday, July 24 from 6 p.m. to 11 p.m., Saturday, July 25 from Noon to 11 p.m., and Sunday, July 26 from Noon to 8 p.m. Lawn chairs welcome. For more information, go to http://www.jefffest.org/. Be sure you are the first to hear of announcements and plans for Jeff Fest and follow @JeffFestChicago on Twitter and Jeff Fest Arts and Music Festival on Facebook: https://www.facebook.com/pages/Jeff-Fest-Arts-Music-Festival/96599731822. 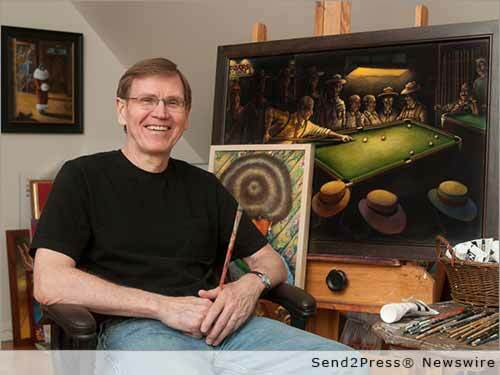 * Photo Caption: Cartoonist Ken Klopack. Original Keywords: Jefferson Memorial Park, Jonathan Jackson + Enation, Hokulea Hawaiian Dancers Jeff Fest Arts and Music Festival Chicago Illinois CHICAGO, Ill.
REFERENCES: Chicago Business News, Jefferson Memorial Park, Jonathan Jackson + Enation, Hokulea Hawaiian Dancers Jeff Fest Arts and Music Festival Chicago Illinois CHICAGO, Ill.